You can drink out of some, you can’t even touch others. There are hundreds of rivers in the world, coursing through every possible ecosystem. Some rivers cross continents and branch tree-like into dozens of tributaries and lakes, determining the environments of whole countries. Others are as large as football fields and move water and organisms from one place to another. Despite their varying sizes and paths, all rivers are indispensable to life on earth. Rivers are fundamental to the water cycle, provide food and water, enable ecosystems and agriculture, allow for transportation, and create the conditions for so many other benefits. All rivers are not respected and cared for equally, however. Some rivers carry pristine water and foster diverse wildlife, while others have become cesspools of industrial and human waste, bringing disease to those who wade into them. The world of rivers is divided. Here’s a look at the extremes on both sides. The Ganges River travels more than 1,569 miles, or 8,284,320 feet, through India and Bangladesh. It’s massive. Some parts of the river, closest to the source in the Himalayan Mountains, are clean and reliably provide drinking water. But the further the river gets into India, the dirtier it gets. Overall, the Ganges absorbs more than a billion gallons of waste each day — making large stretches unrecognizable. Seventy-five percent of this is raw sewage and domestic waste. The rest comes from industrial runoff — mostly from tanneries that leak extremely toxic substances. Even still, it’s widely used for irrigation and in houses and buildings. The Indian government has been trying to clean the river up for decades, and Prime Minister Narendra Modi has poured billions into the latest round of efforts. To India’s Hindu population, the Ganges is more than a river. It’s the embodiment of the goddess Ganga. So cleaning it up is important on several levels. 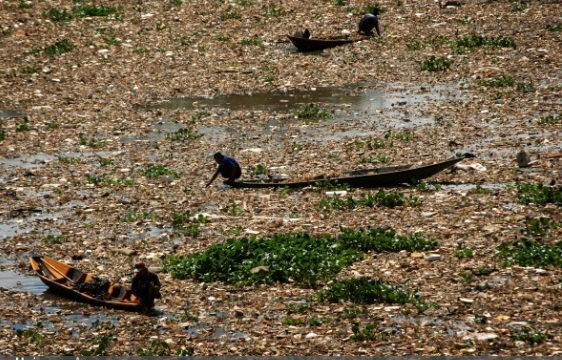 Near Indonesia’s capital, Jakarta, the Citarum river curves, choked with garbage and waste, supporting 30 million people who rely on it for agriculture, domestic, and personal uses. More than 200 textile factories crowd the river banks, pouring toxic dyes and chemicals into the water, and raw sewage freely flows into it. The river emits a rank odor, and if you can see past the “carpet of junk,” the water is murky, teeming with slimy eddies. Since the river lies below sea level, severe floods overwhelm the city’s drainage system and bring more garbage and waste into the waters. The Jakarta Environmental Management Agency reported that there is "no clean water in Jakarta's rivers." The waste has so devastated the ecosystem that dead fish always dot the surface. As a result, many fishermen have given up their trade and instead harvest plastic waste from the surface to recycle. Slums and shantytowns swarm the shores of the Pasig river, in Manila, the capital of the Philippines. This concentration of poverty directly contributes to the river’s neglect. Sewage and garbage pour daily into the river from the communities living alongside it. Similar to the Ganges and Citarum river, the Pasig also absorbs enormous amounts of industrial runoff. The Pasig is so heavily polluted that it has been declared “biologically dead,” meaning no life is able to survive in its waters — no fish, no plants, no nothing. The Tara River cuts through Montenegro, Bosnia, and Herzegovina and is fed by pristine sources of water. The river cuts through mountains and even forms the deepest canyon in Europe, the Tara River Canyon, which is recognized as a World Heritage Site by UNESCO. The water is so clean that you can drink from it. It hosts a vibrant array of plant and animal life. And the river is also a favorite for river rafters and hikers from around the world. Several attempts to build dams along the river have been stopped because of intense opposition. The Tara is beloved in the area and nobody wants to see harm come its way. Located in Southwestern Ireland, the Caragh river flows through lush greenery and farmland. The river suffers very little pollution and is one of the top salmon-catching locations in Ireland. Ireland is known for its clean, quiet landscapes and the Caragh river is no exception. Parts of the river are protected under a national law for conservation. The River Thames is an environmental success story. Fifty years ago, the river was so polluted that it was declared biologically dead. In the 19th century people regularly contracted cholera from the water and died. Then the government launched an ambitious restoration campaign that banned factories from dumping pollution into the water and installed water treatment plants all along its course. Over time, the river began to recover and today it is widely regarded as the cleanest river in the world that flows through a major city. The X factor for the health of all the rivers in the world is humanity. Humans can live in harmony with rivers, ensuring the quality of the water and protecting ecosystems. Or humans can recklessly destroy rivers with garbage and waste. The good news is that all rivers can be cleaned if the willpower is mustered. In the years ahead, let’s hope that more countries follow the path of the Thames.